This day of recollection will consider this spiritual maternity of Mary as a special grace that prepares us for Jesus’ coming anew into our lives. We will consider together how Mary magnifies Jesus for those who want to find Him and she helps us to rejoice in Him. In particular, looking to the wisdom of the saints and mystics, we will consider the gift of prayer that Mary helps us receive. These reflections are especially offered for those looking to deepen their prayer life before Christmas. Christian mysticism is rooted in the mystery of Christ, and the only secret knowledge it provides is the knowledge of faith. Faith's secret is the secret of love. The Bride of Christ lives in the presence of her Beloved from whom she receives the secret of love. All who share this secret discover a whole new way of life, a supernatural kind of living in this world but not of it. This is true mystical knowledge, a kind of knowing that results from the members of Christ body encountering Christ Himself. This ‘hidden’ knowledge should not be confused with esoteric experiences which some non-Christian spiritualities claim to provide. Esoteric knowledge or enlightenment is arrived at by meditation technique and is at best an admirable human achievement. Christian mysticism does not culminate in this sort of enlightenment nor is it the result of what is mastered by techniques. The knowledge which Christian faith provides is “mystical” insofar as it involves a union with the mystery of Christ through the holy mysteries unto union with the Holy Trinity. It is a contemplative knowledge that anticipates the ultimate end of the Divine Economy, the perfect unity of creatures with the Holy Trinity in which the fulfillment of all desire is realized – that eternal beatific vision of inexhaustible and exceeding Love. In itself, such knowledge is beyond the ability of human speech to fully communicate because it exceeds the power of human intelligence to conceptualize. The mystery of Christ cannot be contained in the narrow confines of any created intelligence’s categories of thought. This kind of knowledge is so different from natural knowledge that some comtemplatives refer to it as "unknowing." All other thought loses its dynamism, except the thought of Christ. The only reason this kind of mystical knowing is possible is because in the fullness of time, the Word became flesh. Because the Word dwelt among us and poured out his substance on the Cross, the truth bearing statements of our faith, the articles of our faith, bear the Truth which is the Lord. It is this Truth that is encountered in Christian prayer and to which our faith holds fast. Because the natural power of the human mind is incapable of attaining it, it is described as a dark night, a cloud of unknowing, a wound and a ray of darkness. Because it surpasses all intellectual operations this knowledge is described as a loving glance, a touch and a divine kiss which goes beyond the intellect into the very substance of the soul. The mind receives this heart to heart by way of gift – the gift of faith. Under the fruitful power of the Holy Spirit, this gift opens up a purified understanding of divine things and the very wisdom of God. This kind of seeing which faith avails is called contemplation, a seeing which is at the same time a hearing of the Word. Though the simplest of children can enjoy this loving knowledge, theologians and mystics struggle to articulate it. Yet, as St. Augustine observes, woe to us if we do not try because “No one can know the true meaning of the language of the spiritual writers if he is unable to explain it theologically; and, on the other hand, no one can know the sublimity of theology if he is ignorant of its relation to mysticism.” Garrigou-Lagrange, Three Ages of the Spiritual Life, trans. Sr. Timothea Doyle, OP, London: Herder (1948) pp 16 and 20. To know Jesus Christ is not reducible to an intellectual experience – it is an experience that takes up one’s whole person and demands the response of one’s whole life. This kind of knowledge is transformative, making one’s life so completely different that some, like St. Paul, will “count all else as rubbish” save for this knowledge of Christ Jesus. Such knowledge demands a new way of life – a life in and for love alone. It is a performative knowledge. It leads to a life of fruitfulness, a life rooted in Christ’s salvific mission. But here I must end this already too long post! Spiritual theology seeks the connection between the articles of the faith, the perfection of the Christian life, and a kind of knowledge called “mystical,” a kind of knowledge arrived at through an ecclesial and personal encounter with the Living God. In doing so, it is not primarily concerned with individual religious experience although considering such experience is not beyond its scope. More properly it considers the spiritual life of the Church: how is Christ communicating his divine life to his mystical body, his bride? The answer to this question involves mystical knowledge that results from encountering Christ. This kind of knowledge is “mystical” insofar as it involves a union with the mystery of Christ through the holy mysteries unto union with the Holy Trinity. It is a contemplative knowledge that anticipates the ultimate end of the Divine Economy, the perfect unity of creatures with the Holy Trinity in which the fulfillment of all desire is realized – that eternal beatific vision of inexhaustible and exceeding Love. The object of spiritual theology as a science is the encounter of the Holy Trinity in the contemplation of the Church. In this sense, spiritual theology corresponds with what the ancients called theology or mystical theology. Namely, a participated knowing of the ineffable inner life of the Trinity by grace. Those who attempt to study this kind of knowledge aim at true theological wisdom, a wisdom that ought to inform all the various branches of theology. In itself, this knowledge is beyond the ability of human speech to fully communicate. But the truth bearing statements of our faith, the articles of our faith, bear the truth of this knowledge above all. Theologians and mystics struggle to articulate it. Garrigou-Lagrange observes, “The mystics … explain the hyperbole and antithesis to which they have recourse in order to draw us from our somnolence and to try to make us glimpse the elevation of divine things.” He goes on to conclude, “No one can know the true meaning of the language of the spiritual writers if he is unable to explain it theologically; and, on the other hand, no one can know the sublimity of theology if he is ignorant of its relation to mysticism.” Three Ages of the Spiritual Life, trans. Sr. Timothea Doyle, OP, London: Herder (1948) pp 16 and 20. After the great scholastics who revived interest in a disciplined pursuit of these questions, one of the earliest pioneers of this study was Rev. Jean Gerson, Chancellor of the University of Paris. He believed that the knowledge which flowed from Christ's presence in the soul or mystical knowledge could not be a direct object of theological research, yet at the same time he acknowledged its importance for the Christian life and attempted to elucidate those parts fo the Christian life he believed could be studied. From the 16th to the 20th centuries, spiritual theology became divided between what was called “ascetical” theology and “mystical” theology. Ascetical theology had more a moral element and concerned the day to day discipline of the Christian life and the ordinary life of grace. Mystical theology tended toward a theology of prayer and contemplation as well as speculative considerations of the mysteries of the faith in relation to extraordinary mystical phenomenon. Twentieth century theologians began to question the wisdom of separating these areas of study. They also became concerned that this kind of theology was not considered ‘academic’ or ‘scholarly’ or in any other sense a serious field of knowledge. The 20th century pioneers of this field, mostly Thomists, began an apologetic to establish the field as a legitimate science with its own object and appropriate method of research. At the same time, theologians coming from the Ressourcement schools also became aware that this branch of theology should not be separated from other theological efforts, that these other branches needed reference to spiritual theology if they were to remain with the stream of the tradition of the Church. Spiritual theologians, especially those out of the Thomistic and Ressourcement schools, see that research in spiritual theology is vital to the life and mission of the Church because if it is forgotten, the very raison d’etre of the Church is at risk. As one of the pioneers of the twentieth century renewal of this field, Fr. Juan Arintero, explains: “We must examine and consider attentively the hidden and mysterious development of the inner life of the Church. This consideration is fundamental and the most important of all, because this inner life and the exigencies of this vital process are the course of the Church’s development in doctrine and organization.” Mystical Evolution, vol. 1., trans. Jordan Aumann, Tan: Rockford (1978) 1. Elisabeth of the Trinity was a Carmelite nun who died in 1906 of Addison's Disease. Prior to beatifying her in 1984, John Paul II identified her as one of the most influential French mystics in his own life of prayer. He appreciated the intimacy with the Holy Trinity she promotes in her writings. This intimacy is not only one of prayer but also action, prayer and action centered on Jesus. In the following passage, she reflects on the encounter of Jesus with the Woman at the Well. At one point in this encounter, Jesus explains that God the Father seeks worshippers "in spirit and in truth:"
"To give joy to His Heart, let us be these true adorers. Let us adore Him in "spirit," that is, with our hearts and our thoughts fixed on Him, and our mind filled with His knowledge imparted by the light of faith. Let us adore Him in "truth," that is by our works for it is above all by our actions that we show we are true: this is to do always what is pleasing to the Father whose children we are. And finally, let us "adore in spirit and in truth," that is, through Jesus Christ and with Jesus Christ, for He alone is the true Adorer in spirit and truth." , Complete Works, vol. I, I Have Found God, trans. Sr. Aletheia Kane, O.C.D., Washington D.C.: ICS (1984). p 108. Her feast day is Nov. 8. If you study the Life of Antony by St. Athanasius, one striking aspect of the story is the "anachoresis" of Antony - his withdrawal into solitude and into the desert. It is often tempting to write this off as anacharistic, the spirituality of another time period. But if those beginning to pray would have something new to offer the world, finding solitude and making desert retreats are key. "There is no serious study without withdrawal, a temporary refusal which may look like desertion, an evasion. It is however not by keeping au courant with daily facts or by discussing the slogans of the man of the street and the latest formulations of current objections that you live in your time and perpare for action." San Francisco: Ignatius Press, 1987, p 55. To understand part of what de Lubac is getting at, it is important to associate two activities that today are seldom associated at all: prayer and study. Nearly everyone agrees that study entails a quest for the truth. But in the West, since the time of Francis Bacon and St. Thomas Aquinas, we have been divided on what Truth is. For Baconians and most scholars today in whatever field, truth is whatever is verifiable or demonstrable by supporting data. Here, study does not require solitude and has no relation to prayer whatsoever. It requires hypothesis, collaboration with peers, finding and assessing data in light of the hypothesis, to prove or disprove its validity. For St. Thomas, Truth is above all a Person, a Someone whom you encounter. We can find Truth first of all because He has revealed Himself in what He has made. He has also revealed Himself in the history of human events. Finally, he continues to reveal Himself to us personally, above all in prayer. Because of the way He has revealed Himself, we constantly find Him anew through both study and prayer, faith and reason. Why can we discover Him through a disciplined and prayerful use of reason? St. Thomas understood that Truth is Reason or Logos Himself - the very Creator of human reason. In creating human reason, He made it so that it could help us find Him, because far from being indifferent, the Word yearns for each one of us, particularly, and longs for us to be in communion with Him and one another. Yet, human reason by itself is not enough to find Him. The light of reason needs the light of faith to find what it searches for. Whereas reason is given by virtue of our nature, faith is a sheer gift. To recieve it, we must ask the One who made us, and this petition requires a humble prayer, a cry in the dark. And His answer is more clearly heard in solitude, in the wilderness, by waiting in vigil even through the night. If the Gospels are read carefully, we discover that this is precisely the way Jesus prayed, the way He studied the Will of the Father, so that through the obedience of Christ to his Father we too might become the sons and daughters of God. The discoveries of science have greatly benefited the world in most cases, but the discoveries of faith have saved it from destruction. The world without God exhausts itself because it cannot generate anything beyond itself. It is growing old and sick. All the great efforts even in science begin to seem more and more futile because science cannot address the deepest things of the human heart. To really thrive, the world must live in the light of heaven, of something more beautiful than itself. This is as true on the world stage as it is in our families and local communities. No real Christian can be indifferent to this. Christ commanded us to love and when we see others who fail to thrive our own hearts must be pierced - or we are not worthy to be called Christian. We know world needs the Lord, and that the Lord in his mysterious plan has chosen us to witness in the world. But how can we witness to someone whose heart we have not studied? This is why we must imitate Christ in attending to the heart of the Father through constantly making time for solitude, study and prayer. "Prayer and theology are inseparable. True theology is the adoration offered by the intellect. The intellect clarifies the movement of prayer, but only prayer can give it the fervour of the Spirit. Theology is light, prayer is fire. Their union expresses the union of the intellect and the heart. But it is the intellect that must 'repose' in the heart, and theology must transcend it in love." Olivier Clement, Roots of Christian Mysticism, p. 183. In the face of death, it can seem impossible to pray. How is Christ present when we lose a loved one? The answer is not always clear and sometimes never is. All the same, our faith compels us to seek the presence of Christ even when we lose someone dear to us. I have recently returned from the funeral of a wonderful friend, Carol Sander. After a struggle with cancer for over ten years, the Lord has taken her home. She did not seem to willingly accept death until the very end. Perhaps this was because her love for family and friends was so great, she wanted to hang on as long as she could to be with them. There was a beautiful funeral mass in Glenville, NY for all her friends and immediate family - and then there was a second funeral mass at the Shrine of Our Lady of Czestochova, Doylestown, PA to which more friends and extended family came. A devout Catholic and Third Order Carmelite, she was remembered as a great wife, a mother of two wonderful adult children, and a teacher who worked with mentally challenged children. She was especially remembered as someone who really loved everyone the Lord put in her path. She maintained this discipline even as her struggle with cancer required that she draw back from her career and other activities. Yet cancer could not stop her generous witness to love. Even the local grocery store sent her flowers. At the same time, she was an artist not quite at home with suburban American culture. I imagine the pain and tension of such a life must have been great, and this all the more so as her physical struggle became more intense. In her case, this suffering compelled constantly renewed efforts to draw her strength from the Lord, to find in Him what she needed to continue to love, even when continuing to do so felt impossible. In Doylestown, there was a wonderful experience of the richness of Polish piety and culture. One had the sense of being with "the children of the forests and the plains." The enchanting simplicity of the Lord Jesus was central. At the same time, this rich encounter with Jesus was also with the maternal presence of his Mother, Mary. I could not help call to mind the great faith of John Paul II and his call to build a culture of life and civilization of love. All of this was part of Carol's own witness to the Gospel of Christ. Towards the end of Mass, as her brother, Fr. Raymond Gawronski, S.J., sang a traditional Polish song to Mary for those who have died, the local grounds keeper joined him. In fact, the grounds keeper was like a living icon of the Risen Lord, the mysterious gardener near the empty tomb. Always in the background, he was solemn and at the same time generously present whenever he was needed. Completing this contemplation, two priests of the Society of Jesus stood with Fr. Gawronski and his family. The gardener, the brother priests, the faithful family members drank together the sorrow, joy and hope of those last prayers as Carol's body was laid to rest. All of this has helped me call to mind the great promise of Christianity. Our faith does not promise us glory, or happiness, or relief from suffering in this life. Instead, Jesus commands us to love without counting the cost. This means to love even when there seems to be no reason to do so. It means trusting that God is at work in love even when what He is doing seems completely hidden and our efforts entirely wasted. This means we must not avoid suffering when that suffering is for the sake of love. Suffering in love is never wasted - there is great value in it. Living in love, suffering in love and dying in love is what the Christian faith calls us to. Suffering in love for the sake of love touches the very heart of what it means to follow our Crucified God. This is the power of the Cross. This is what transforms not only our own lives, but the whole world. To this end, Carol's brother, as he called to mind her life, remembered the great words of John of the Cross, "Where there is no love, put in love, and you will draw out love." May Carol Sander and the souls of all the faithful departed rest in peace. Amen. Today is the feast of St. Jerome - a saint noted for his hot temper. For those of us who struggle with a more or less sanguine emotional life, it is always consoling to discover that we are not alone, that even great saints had to deal with irrascibility. Self-control and gentleness are fruits of the Holy Spirit in our lives. I think it provides extra glory to God when He is able to produce this fruit even though our personalities seem to fight against it. The witness of the saints is that only through prayer do we learn to surrender ourselves so that the power of the Holy Spirit is manifest in our weakness. Anthony Bloom wrote a book called Beginning to Pray and this book has some great advice about how to start a life of prayer. At one point, he relates a story about one of my favorite saints, Philip Neri. This youth minister who renewed the Church of Rome by starting a prayer group in the 16th Century was given a great grace as a young man. He noticed that he had a very hot temper, especially when provoked by some of his brothers. So he prayed for an intense length of time, asking the Lord to help him overcome his anger. Immediately after his prayer, he ran into the one brother with whom he never fought and this brother insulted him out of no where. They got into a horrible fight. Then, after this exchange, a similar thing happened with another brother. Philip was dismayed and returned to prayer to complain, "Lord, didn't I ask you to free me from anger?" The Lord patiently responded, "Yes, that is why I am multiplying the opportunities for you to learn." Anthony Bloom explains why this is not an uncommon experience in prayer. We do not have the space to explore his explanation further. For today, we will simply note the Lord answers us when we ask for good things the right way. His answers, however, are always different from what we anticipate. We do not always recognize the gifts He floods us with because our vision is limited by our own expectations. For those of us a little hot blooded, coming to appreciate how wonderful it is that God does not allow himself to be confined to our expectations is a first step to true spiritual freedom. Because it is so important and so overlooked, I would like to return to this theme again. From ancient times, Christians have blessed themselves with the Sign of the Cross. In the West, this is done by touching with the fingers of one's open right hand the forehead, then just below the chest, then the left shoulder and finally the right shoulder before folding one's hands in prayer. This action is accompanied with the words, "In the Name of the Father, and of the Son, and of the Holy Spirit. Amen." Why does prayer start with this action in Roman Catholic spirituality? It is an action that can renew the grace given to us at baptism, if we make this action in faith. Let me explain. When we are baptized, we are always baptized in the name of the Father, the Son and the Holy Spirit. This is what Jesus commanded the disciples to do -- and he never commanded them to do anything other than act in the authority and power of God. Whenever something is done in the Name of God one is claiming to something from God, by his authority and in his power. This is precisely what a minister of baptism claims to be doing when he baptizes in the Name of the Father, the Son and the Holy Spirit. He is not acting on his own human authority or giving something which is within the mere human ability. He is doing something in the power of the Holy Spirit, by the authority of Christ Jesus, for the glory and honor of the Father. And what does Baptism do? Through this action we receive the gift of the Holy Spirit: He dwells in us as in a temple so that all the riches of Christ can be ours. This Gift is like a living waters constantly cleansing us and healing of our sins - not only those sins for which we ourselves are responsible, but also the original sin that we inherited from our forefathers. This Gift is like a pillar of cloud hiding us from those spiritual powers and principalities which had once captured us and robbed us of our true freedom. This Gift is a consuming fire which burns up the selfish, arrogant and prideful impulses which characterized our former way of life. By faith and baptism, the Lord and Giver of Life always comes in unrepeatable ways giving more and more new divine life, moving us in ever new and unimaginable ways to offer ourselves as a living sacrifice to God. His living presence radically identifies us with Christ Jesus whenever we permit him to. At each moment, He is ever ready to join us to Christ's death that we might rise with Him through his resurrection. The Holy Spirit is not an impersonal or indifferent guest within our hearts. He never runs out of room because He constantly enlarges our hearts: purifying them, ordering them, and expanding them. His fire and light makes us burn to love God and our brothers and sisters with a love greater than any limited natural love. He deifies us, makes us partakers of the divine nature, so that we love with the love of God. He also respects us - and will only do what we permit Him to. But He is never passive. He is ever alive, ever ready to increase whenever we say yes to Him in faith. The more we say yes, the more He is there to help us - even when all seems dark and lost this Divine Presence is with us in our hearts. If we are not to drown in our own weakness, the constant attacks of the Evil One, and in the anxieties and fears of the world, we must cling to the Spirit's presence like the shipwrecked cling to life-preservers. We must cleave to His Presence, hold firm to it, believe in it, stand fast in it. Yet, our own frail humanity is always forgetting, always letting go to cling to things we think more firm. But they are an illusion. We can only cleave to the Presence of God in our hearts through the strength and the certitude that He alone provides. This is where the Sign of the Cross comes in. When we make the Sign of the Cross, it is a sign that we are choosing to cling to the Living God who dwells in us through the Gift of the Holy Spirit. Making this sign can actually be a moment of actual grace in which the promises of faith made at our baptism are renewed and the Gift of God remembered. And with the renewal of our faith, the Lord grants us a new strength to hold fast, a certitude and confidence that ever comes from Him. The discipline of prayer includes sanctifying time, offering one's own time to God at various moments of the day, including the end of the day, the evening. Time is first of all a precious gift from God. Not a single moment is to be wasted. Time spent in prayer is never wasted. The sanctification of time is one of the effects and purposes of prayer. Most people look at prayer as principally a psychological and therapeutic exercise. They do not normally see prayer as something that actually changes time. But prayer is not simply psychological or therapeutic. It is interpersonal, in the Body of Christ for the glory of the Father and the salvation of the world. Because the prayer of Christ is always effective, Christian prayer is effective to the degree it is in union with Him and the desires of his heart. It is his desire that all things, including time itself, should be offered in thanksgiving to the Father for the salvation of the world. The reality is, Christians, as members of the Body of Christ, make time pregnant with grace whenever they pray. When we pray, this grace-filled time becomes part of our offering to the Father in Christ. One public way this offering is made is through the Liturgy of the Hours. Based on the ancient Jewish observance of praying seven times a day, the very first Christians offered psalms together at certain hours keeping vigil night and day. Some ancient authorities suggested that this was how to obey Jesus' command to pray always (Luke 18:1 and 1 Thes. 5:17). Today, priest and religious around the world continue this ancient practice. Morning and Evening prayer are strongly encouraged for the lay faithful. In November of 2006, I was invited to make a retreat with the monks at the Grande Chartruese. I had come to France to give a conference on Blessed Elisabeth of the Trinity and the Carthusians supported this effort by their generous and extraordinary hospitality. For those wanting to take up a life of prayer, making a personal retreat at a monastery can be a great help. There is something about the witness of men and women who have dedicated their lives to prayer that helps us make prayer more of a priority in our own lives. While many monasteries welcome pilgrims for this purpose, the Carthusians normally can not do so because of the discipline of solitude and anonymity that is part of their way of life. So to be able to be with them was an extraordinary grace, one that changed my life. The following poem is by one of my students, Tanya Swegler, after hearing my description of praying with the monks on that occasion. St. Bernard built a way of life that flowed from Chapter 73 of the Rule of St. Benedict. In this final chapter, St. Benedict urges monks to learn the discipline of the Christian life he has presented because it is a good beginning, the minimum needed to make progress in a life devoted to Christ. Once one makes a good beginning, Benedict explains, "You can set out for the loftier summits." St. Bernard devoted himself to encouraging contemplatives to go beyond the minimum and progress to the summit of spiritual maturity. This summit is characterized by love. In our last post we considered the first kind of love, the foundational love for the spiritual life. This is what he calls love of self for one's own sake. We saw how this kind of love leads to a love of God. Namely, in order to really love one's self, we find ourselves turning to God and asking for his help. When we begin to percieve how good He is to us, we come to love Him because of what He has done for our sakes. To live a life out of this kind of love of God is very good. Bernard however sees that the Lord has called us to something even more beautiful. Through the grace of Christ given us, we have the possibility to learn to love not only for our own sakes, but for God's own sake. In this kind of love, we glimpse the hidden source of Christian contemplation and mission. What does it mean to love God for God's own sake? This is to begin to see Him quite apart from anything that He has done for us. Love is beautiful and God is Love. To behold Him, to cherish his love in itself is not within our natural power, but we were created to be open to this vision. When we sit in silence before the Lord, wasting time in his presence, we open ourselves to God's power to raise us above ourselves. Contemplative prayer is this openness to God. Such prayer is receptive to a subtle movement of the Holy Spirit by which He prays in our hearts. When we permit the Holy Spirit to do this, He communicates a new kind of love, a divine love. It is with this divine love, the love God has for himself, that we begin to see, to contemplate the beauty of the Lord from His own perspective. St. Bernard describes this kind of prayer as "tasting" the goodness of the Lord. One might think that this was the highest form of love - loving God for his own sake. But Bernard believes that tasting the goodness of the Lord leads to an even more profound kind of love. In this experience, we find ourselves moved no longer by what we think we need for ourselves or those needs we believe those we love suffer. Instead, we are touched by the loving desires in the very heart of God. We find ourselves pierced to the heart by those things for which the Lord himself yearns because His hopes and dreams are beautiful and wonderful to behold. A new passion envelops us and our lives are ignited with the fire of God's love. As we learn to live fired up by the very passion of the heart of God, St. Bernard says we begin to love ourselves for God's own sake. The self for St. Bernard is not the same as the "ego" or "me." The self he describes is always an "us." He always understands the human person saved by Christ as being in communion with others. Those who believe in Christ are brought into communion with his whole mystical body. As a result, loving one's self always includes loving all those Christ has entrusted to us. In the heights of love, we learn to love one another with the divine love the Lord has had for us from before the foundation of the world. Just as God yearns for us to thrive in his love, we learn to live with this same passion for ourselves and for one another. We see in each other the beauty of God's holiness and we yearn with the same desire that burns in the heart of God for that beauty to be fully manifest. Christian charity, its orientation to serve, is not merely a wishful and naive human philanthropy. It burns with something this world cannot contain. In St. Bernards mystical theology, the truth of our humanity is realized in this burning divine love within us. Tomorrow will be the feast of St. Bernard. A brilliant monastic thinker of his time, he helped contemplatives understand their growth toward spiritual maturity. He presented his ideas in terms of love - the growth and development of love in our life of faith. The first kind of love on which growth in the spiritual life depends is a healthy love of self. He calls this, "love of oneself for one's own sake." In general, people who look out for themselves tend to avoid harmful behavior and embrace a good style of life. This is also true of people of faith. If we believe in God but fail to care for ourselves, our faith really does not do us much good. But if we want a better life for ourselves, we find ourselves oriented to a godly life. We want salvation - freedom from all those things that prevent us from becoming who we really are. When I first began to understand this insight, I had this knee jerk reaction about loving myself for my own sake. True, Jesus said that we should love our neighbor as ourself and St. Paul asserts that no one hates his own body but rather cares for it. Yet loving concern for "self" has a paradoxical relationship to the Gospel mandate "deny yourself and pick up your cross." Here, we will not resolve this paradox except to say that if we did not have a healthy love of self we would be less Christ like. Even he, the night before he died, prayed that if it was the Father's will, he might be spared his suffering and death. This indicates that the movement in the Lord's heart to love to the full, to lay down his life for oursakes, presumes he valued the gift of human life He shared with us and that all things being equal He wanted to keep it. Life was something precious to Him otherwise it would not have been a sacrifice to lay it down for our sakes. Christ's attitude toward life is the attitude that every Christian must have. Christians who want to mature in their faith must learn to treasure the life entrusted to them and to reject squandering it on bitterness or brooding. Life is approached with a wonderful sort of vigor and freshness when we see that each heartbeat, each breath, is an irreplaceable gift. Those who have suddenly been healed of what should have been a mortal illness know this feeling. Even those who have been told they will soon die can make the interior decision to make the most of life right now. When this sort of decision is made - the decision to live life to the full, one has begun to embrace what St. Bernard means. This kind of decision to live life to the full is, in the thought of St. Bernard, a decision to love oneself for one's own sake. One important aspect of this decision: it is not selfish but profoundly connected to those whom God has put in our lives. Every moment spent with a loved one or any little sacrifice made to take care of them is a joy - because somehow these other people we love are connected to us. The "self" co-inheres, or at least it is meant to co-inhere in those we love. This means taking care of them is a wonderful way to take care of oneself. When we choose to live like this, the discipline of the Christian life makes a lot of sense. Daily prayer, giving up unnecesary things, small acts of love that no one notices, being fully present to and cherishing those God has entrusted to us, being passionate and pursuing excellence in work given to us, praying before meals and sharing them with others, avoiding insobriety and guttony, generosity to all - these practices simply flow out of a life lived to the full. Another thing also happens when we try to live this way. We discover that we can not do it by ourselves. We need God's help. So, we begin to ask Him and we begin to discover the loving Providence of God. He is so unimagineably good to us in so many tender ways - but often we do not see it because we have never humbled ourselves to ask for His assistance. When we do humble ourselves and go to Him - we soon find ourselves filled with all kinds of gratitude. We even discover, sometimes to our own surprise, we really love God. And we will look at this next step of love in our next post. St. Bernard of Clairvaux has a dynamic understanding of the Truth that is vital for anyone who wants to grow in prayer. It is the first step on his ladder of humility. For him, Truth is not merely something we seek with our mind but a reality we embrace with our lives. Truth is not merely an idea but a lived experience. He sees no difference between right thinking and right living. "I am the Life, the Truth and the Way." Bernard roots his insights into Truth by identifying it with Jesus Christ. He explains that Truth is the One who comes to us "naked and weak and in need." This means the Truth does not force himself. He waits for us with a longing love to accept him. What stands between us and the One who comes is our ignorance, weakness and jealousy. But these things do not discourage the Lord and they should not discourage us. Truth for Bernard not only overcomes our ignorance but gives us strength and raises us above our own pettiness to behold the Lord's merciful love. Humble self-knowledge, the strength to be merciful and contemplation of God in purity of heart mark the progress Truth alone produces in our hearts. The naked Truth is more powerful than our ignorance. That is, Jesus stripped and scourged for our sins has power over our wounds. Those who want to begin to understand themselves need to turn their thoughts to the Lord and what He has done for them. Thinking about how much he suffered for us leads us to ask, why? The answer is that he wanted to share fully our misery so that we might share fully in his mercy. When we look to him and what he has done for our sakes, we begin to realize the utter disaster from which his death delivered us. The truth is, we are ignorant of what is really going on in our hearts, of the terrible suffering and abysses of misery that drive us to all kinds of ugly behavior. For Bernard, the Lord only allows us to suffer this truth so that we might desire something better. In his understanding of holiness, the foundational love that helps us begin the spiritual life is a healthy love of self. This might sound a little selfish if we do not understand it from Bernard's perspective. For him, the idea of self is always the self in relation to others. It is never the isolated self. If we have the sort of self love he has in mind, we yearn for righteousness the more we see who we really are and what Christ has done for us. Christ died for us that we might know real joy, true happiness. By his death and ressurection he establishes us in his own righteousness. But we need to desire this with all our might. This kind of desire for righteousness is informed by an acute awareness of how much we need the Lord. All of this co-inheres in the way we regard others. If we desire righteousness for ourselves and we are truly in relation to each other, we discover a new way to love our neighbor. Truth and the healthy self love it engenders helps us to cease judging our neighbor and to have compassion instead. Without a godly love of self, when we see wickedness in others we tend to righteous indignation because in our weakness this is easier than compassion. To really be compassionate means to look at the needs of others as one's own and know how to suffer with others in their troubles. When we humbly accept the trainwreck of our lives that the Truth reveals, we realize that we are not that different from our neighbor. We all carry a common burden of sin and we all face a common death. This is the beam in our eye. Christ helps us see this and to take it out. Once we see, then all indignation over my brother's failures dissipates. We feel the desire to be merciful instead -- that is, to suffer with our brothers and sisters so as to affirm their dignity. Mercy begins when there is a kind of compunction, a piercing of the heart that takes place. When the plight of my neighbor strikes the very core of my being - I can no longer sit in judgment. I can no longer be cold. My neighbor is in the same boat as me and we need one another if we are to endure in Christ's love. Bernard even speaks of an ecstacy - a mystical experience whereby we are drawn out of ourselves and into the merciful love of God for our neighbors. The final stage of truth is purity of heart. There is a contemplation of God's mercy that raises us above ourselves. In this prayer, we see the truth about God. Petty jealousy and pride is destroyed - because we see the Lord and the world in a whole new way. Those who, relying on Christ Jesus, persevere in humility or accepting the truth about themselves and persevere in mercy or suffering with others, enter into a deep and profound union with Jesus, the Holy Spirit and the Father of Mercy. This is a contemplation of the Lord in purity of heart, a contemplation to all who are willing to welcome the Truth who comes to us naked, weak and in need. Nescivi – I no longer knew anything. This is the first word of the last retreat reflections Elisabeth of the Trinity would author. These words denote an experience of Christian enlightenment different from any other kind of enlightenment ever known. Faith gives us a certain but general kind of knowledge different from any natural light by which we might see things. In this kind of knowledge, love leads and understanding follows. It is the knowledge of of one moved by eros - but not simply a natural love, divine eros drives the heart. It is August 16, 1906. She is suffering from Addison’s disease and will die within three months. She is racked in pain and weakening, unable to nourish herself or sleep. She has been struggling with this illness for a year. Severe pain for long periods of time has a way of purifying what we see in life. But this kind of knowledge, the knowledge one recieves by suffering chronically and acutely at a young age, is not that to which Elisabeth is trying to draw attention. Merely enduring suffering was not really the driving force of her life. What drove her more than ought else was her desire for Jesus. She was so focused on this pursuit that she even saw her illness as just one more way that she might find him. And she found him all the time, in ever new and deeper ways. Each time she found him, a new supernatural light beckoned her to seek Him even more. Nescivi, as is the case in most all her reflections, has layers of meaning. Some of these are obvious and others subtle, requiring prayerful attention to ascertain. In this case, she asserts that Nescivi is the Bride’s song in the Canticle of Canticles 6:11 and 12. If we look at the Scripture passage itself, it does not quite suggest Elisabeth's explanation. She did not have access to the actual full text of the Canticle of Canticles. Her understanding of the actual scriptural passage draws from a secondary resource: John of the Cross's poetic reinterpretation Spiritual Canticle. Elisabeth identifies with this experience. It is the music of a certain kind of knowledge, which St. John of the Cross explains, is unlike any other kind of knowledge we could ever possibly have. It is personal knowledge of Christ in which the heart leads the intellect. This loving knowledge moves our entire being, dragging the intellect with it. This knowledge is not irrational, but superrational - something which merely human insight cannot arrive at. St. Augustine explains that it is not merely a light above our minds like oil on water -- it is a participation in the light from which our intellects come. It is a kind of divine knowing in us. When we know the Lord in this way, we no longer desire to know anything else. This encounter with Jesus is so magnificent, so absorbing that it envelops our whole existence, captivates the full capacity of our awareness. At the same time, this absorbtion, envelopment, and captivation deepens our uniqueness, makes us even more ourselves. If we lose ourselves, it is only so that we more profoundly find out who we really are. Elisabeth contemplated in this experience her true identity - at once particularly hers and eternally the destiny of those who love the Lord, "to be the praise of his Glory." This is different than any natural sort of enlightenment because of its particular and, at the same time, supernatural character. When the Bride encounters the Bridegroom, her particular identity is realized in their loving encounter as is the truth about the Bridegroom. By analogy, the encounter with Jesus reveals at once the truth about who he is and at the same time, the truth about the soul who encounters Him. But unlike the encounters of nuptial love, this truth does not end in death. Something about this encounter is deeper and more ancient than death itself, and reveals something that the mortal light of nature cannot see. Supernatural enlightenment, the gift of knowledge, allows us to see the world as the Risen Lord sees it - no longer subject to death but a glorious pathway to the Father's House. For Elisabeth, the source and ground of this kind of knowledge is rooted in the knowledge of Christ himself, the song that echoes in the heart of the eternal Son of the Father. No one knows the Father but the Son and those to whom the Son reveals Him. In supernatural enlightenment, each particular human heart is known in relation to God from the perspective of Christ crucified. In turn, Jesus sees each one of us and all of us together with the eyes of his Father. Jesus knows the deep recesses of the Father's heart and suffers the Father's love for us. Christ's heart actually aches to share this love particularly and universally. Similarly, in the Father's wisdom and love, He foreknew each of us and all of us together in his Son. The Father knows how much Jesus aches for love of us. And so, the Father searches for us and waits for us in his Son. His Son is our way to Him. How do we set on this way? Accordingly to Blessed Elisabeth, we must join the music of Christ's soul - the movement of love in his heart, his divine eros must move our hearts as well. His love and confidence in the Father must become our own love and confidence. His love for the world and desire that all might have eternal life, must become the burning passion of our own hearts. When, in our own uniqueness, we imitate Christ, not only exteriorly by our efforts to love but interiorly by faith on which all real love depends, the Father is delighted because now He knows his Son in us. This delight of the Father in us is what Jesus allows us to taste when we encounter Him. As we follow Jesus in this loving kind of knowledge, paradoxically, we become more fully human, more authentically ourselves. How different this is from every other form of enlightenment where we are either absorbed into a greater reality or unmaksed as a mere illusion to hide nothingness. The Father created each unrepeatable and unique human heart outside himself not so that it might be absorbed in Him, but rather that it might be loved and learn to love. Such is divine eros - the love revealed in the household of God. This is the inheritance of the saints. Elisabeth is pointing to this as she begins her reflections for the sisters of her community. This kind of enlightenment, this kind of knowledge, is the most important of all human pursuits. Without it, the true destiny of our humanity remains obscure. It lacks the certainty that only God's love can bring. How do we find this enlightenment? The passion to love God in real friendship, divine eros, is a gift. It is something to be asked for in earnest. Like a Bride, we must utilize our full human capacity, all our effort, all our might, to seek the Bridegroom - for in Christian enlightenment, the one who asks, recieves; the one who seeks, finds; and the one who knocks discovers the welcoming eyes of the Lord. I would like to continue some thoughts on this feast of the Priest of Ars. There was a particular kind of prayer he tried to promote among his people, a kind of prayer which must have been very important to him in his own struggles. He advocated contemplation, a loving awareness of God's presence, especially in the Eucharist. There is this great story about an old man that John Vianney found in the Church just staring at the tabernacle. The priest asked him what he was doing and the man explained, "I look at him and he looks at me." Contemplation is gazing on God with the eyes of the heart. Part of this gazing is to believe He is present even when the heart seems overwhelmed with other things. This gaze of love searches for Him and this search takes time. For those who take up silent prayer, who obey the voice which calls out, "Be still, and know that I am God", such contemplative souls understand why the Priest of Ars was moved by the witness of that old farmer. The question is if St. John Vianney so valued this kind of prayer, why did he also insist on conversion of life and the ongoing struggle against sin? This kind of prayer is so peaceful - why should we disturb it with the hard discipline of the Christian life, the ongoing struggle that seems to never cease? The answer is that this prayer and the peace it brings is not really an end in itself. Contemplative prayer and the peace God gives through it are only part of a way of life in which God teaches us how to be free and true in our friendship with Him. Contemplative prayer does provide a beautiful wisdom that disposes the heart intensely to God so that one is actually freed from those troubled anxieties that too much attachment to the things of this world can cause. In this, there is a very satisfying peace that one discovers. Anxieties and worries do not have the same disturbing effect because worldly affairs no longer seem as important. If persevered with, this contemplative prayer also frees us from false notions - like the idea that religious practices somehow appease the wrath of God, or that the Christian life is all about storing up merits for oneself. But while a certain kind of indifference and equanimity can be characteristics of spiritual maturity, these virtues are only so to the degree that they are informed by charity -- which is friendship love of God. Without charity, these qualities become what Augustine considers splendid vices. It is simply cold indifference to remain detached in the face of a neighbor's plight. It is a slothful equanimity that does not resist such sin. Rather than strengthening our relationship with the Lord, this kind of peace becomes a barrier to the friendship the Lord has invited us into. The temptation to seek the peacefulness contemplation produces rather than God who is the source of all true peace found its theological expression in Quietism two hundred years before the Cure d'Ars. Thinkers like Fr. Maravel, Fr. Molinos, and Mme. Guyon, similar to St. John Vianney, promoted the practice of the awareness of God. They, like the Cure d'Ars, rejected the notion that the spiritual life was about appeasing an angry God. They also upheld, however, the conviction that spiritual maturity requires attaining indifference to sin and one's own salvation. Enchanted by a certain passivity that they mistook for supernatural virtue, they and their followers were often proported to be the source of scandal. Especially dangerous was their notion that one ought not to resist sin - because resistance and struggle disturbs one's inner peace. Check out http://tiny.cc/bvRvJ. Unlike the promoters of Quietism, the Cure d'Ars understood that peace is the fruit of our friendship with the Lord. This friendship requires vigilance and struggle against anything that might harm it. When we struggle against sin, we are really struggling against the tendency in us to act against love, to act without love. Only when we act in love does God create the space in our hearts that peace requires. His secret was to allow himself to be pierced by the plight of the people Christ entrusted to his care. Once pierced by their need for God and at the same time drawn to enter into God more deeply, he found the ability to surrender what he thought was best for what the Lord thought was best. This trap of Quietism is at least partially rooted in a need for control and a lack of trust in the Lord. Becoming passively indifferent about one's own life is so much easier than actively pursuing friendship with God with all our strength and determination. This is because indifference towards one's self does not require trusting God or surrendering to Him who yearns for us. Indifference does not require vulnerability. Like Adam and Eve, such indifference offers a fig leaf, a place to hide from the One who searches for us, something that appeals to our imagination more than the unimaginable thing God has called us to. In his own journey, John Vianney realized Christ's saving hand over this spiritual trap. God's friendship was necessary for real peace. He instinctively understood that this friendship with God, like all friendship, demands daily discipline of opening one's heart and the willingness to go into His heart. Such discipline would be impossible without grace - but by the grace of Christ, this struggle yields peace. In this way, Contemplative prayer and asceticism went hand in hand for him. 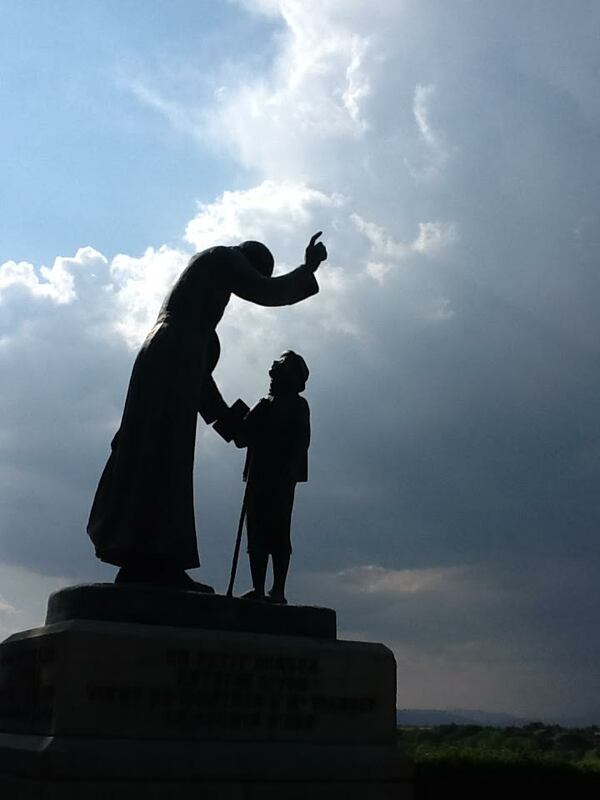 St. John Vianney is a great example of a man of prayer. There are some who want to paint him in tones that are too sentimental and sweet. The strength of his character and intensity of presence is lost in such depictions. He may have been peaceful but he was not passive. For a great snapshot of his character, see http://bit.ly/3whRJ. The way he lived his life showed that true peace is always bought at the price of a great struggle. Part of the struggle for him was to be faithful to the mystery of the priesthood in the midst of personal doubts. Even if he was haunted by a lack of confidence in his ability to be a good priest even to the point of running away from his parish, the Lord made him faithful and protected him in his weakness. With John Vianney, the Cure d'Ars, because of the inexhaustible grace of God, we have a man of true grit who was not afraid to fight the battle of prayer. A small hard working man with a piercing gaze, he defied secular tyranny to become a priest. His dedication to long hours of study remains firm even as his classmates and professors consider him stupid. He is ordained to the dismay of some of his professors and classmates. He is considered incompetent by most the rest of his presbyterate. Assigned a sleepy little country town more interested in bars and dancing than in the Church and praying, the determination and courage that got him into and out of seminary, he takes with him into this ministry. Come what come may he sets himself to do everything he can to help the people entrusted to him realize how much Jesus loves them. They are not a happy lot. Alcoholism, atheism and adulterous affairs have robbed them of the ability to live life to the full. They are for the most part completely ignorant of the joy and peace that Christ has to offer them. Religion, prayer, going to mass, going to confession - these practices are even mocked as old fashioned silliness. In fact, the priest himself is considered old and silly - out of touch with the real world. And in the face of this rejection, this priest must overcome his own impatience and constantly renew his dedication to them for the Lord. He knows a great secret, a secret shared by everyone who tries to enter deeply into prayer to embrace the will of God. Real prayer involves taking up a fierce struggle against the power of sin and death still lingering in our hearts, and only by engaging this struggle can the Lord make us instruments of his peace. Because of Christ has conquered death, as long as we turn to him for help, victory is assured. But this victory comes at the price of many trials and tribulations. True peace is rooted in the struggle to love God and one another. This is why the great witnesses of the 20th Century point to the paradoxical relationship of peace and struggle. As F. X. Nguyen van Thuan explains: if you want peace, you must fight continuously. Behind the doubts that constantly afflicted him lurked a discouraging kind of scrupulosity. Ironically, this affliction became more fierce as his ministry became more successful. As people flocked from all over France to hear him preach and have him hear their confessions, he became more and more suspicious that he was not really being faithful to the Lord. He struggled against the thought that he was self-deceived. He actually doubted that God called him to the priesthood. He suspected that his desire to become a priest was really just his own pride. He was afraid that this same pride was a source of scandal for others. With these doubts about his character and intentions, he was also haunted by the desire to dedicate himself to a hidden solitary life of penance. Sometimes he would even try to run away from his parish. What is remarkable is not that he struggled to be faithful to his vocation, but rather than in the end, he was faithful at all. This was a thorn in his side, the monster that the Lord allowed him to contend with so that he might be purified. The weaknesses of pride and a fearful scrupulosity can involve the temptation to reject of God's plan for us because we think we know a safer way. It is a combination of fear and pride which causes us to limit our spiritual journey to that which appeals to our imagination. But following the Lord is not a matter of the imagination. Acting out of the fantasy that fear, scrupulosity or pride produces does not bring us closer to God. Friendship with God is a matter of faith - of believing in his love in the circumstances we have before us in the here and now. The feelings of inadequacy, powerlessness, that one's life has been a mistake, doubting the goodness of God - no one is really spared these in life. Prayer does not make these things go away magically, even the prayer of a great saint like John Vianney. Following our Crucified God, we must face them on our own path to Calvary - it is only by learning to love in the face of such things that our faith and our prayer becomes real. A real peace and true joy lives in our hearts not because we are without problems, but because in our struggles we find God.